There is a variety of habitat in the Area 2 Wantley walk ranging from urban to arable and including some small woods, mature hedgerows and (while it lasts) some tangly scrub. There is a small water course at Chess Stream which is crossed twice and parcels of pastureland grazed by livestock. The walk starts at Henfield Village Hall, ends up at the back of the Wantley Estate and includes a very short stretch on the Wheatsheaf Road. It is a flat walk of between 2.5 – 3 hours depending on how long we stop to look at birds! There are a number of stiles and in winter a couple of areas are wet. 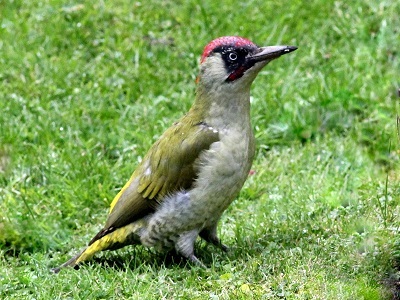 Some of the birding stars all year round are Yellowhammer, Skylark, Meadow Pipit, Buzzard, Nuthatch and both Green and Great Spotted Woodpeckers. In spring Blackcap, Chiffchaff, Whitethroat and sometimes Lesser Whitethroat and Cuckoo are around. Autumn brings Redwing and Fieldfare in large numbers and the wires near Park Farm are often full of Swallows. Superstars making an odd appearance have been Little Owl, Peregrine, Hobby, Grey Wagtail, Treecreeper, Reed Bunting and Sparrowhawk.